Gary, IN-Ancon Construction, premier design build construction company, held a ground breaking ceremony to kick off the construction of Goodwill’s first campus project in the state of Indiana. The ceremonial shovels that lifted dirt Monday in Gary for Goodwill Industries of Michiana’s $8 million charter school and Goodwill outlet store marked the organization’s first campus project in Indiana, said Debie M. Coble, its president and CEO. Coble said her organization has been looking for land for about four years before it settled on eight acres at 4610 W. Ridge Road, just west of Clark Road. Barenie Lawn Decorations, 4800 W. Ridge Road, sold Goodwill the land, Coble said. The 105,000 square-foot, one story building that will hold the Gary Excel Center charter school will serve adults, aged 18-and-over, who dropped out of school. There will also be a Kids Excel preschool program for children of adult students. Ancon Construction, of Goshen, has been retained to build the campus, Coble said. The complex also includes Goodwill’s first outlet store, with most items sold by the pound, and a donation drive-through area. A community career center will also be offered to provide free job search assistance. 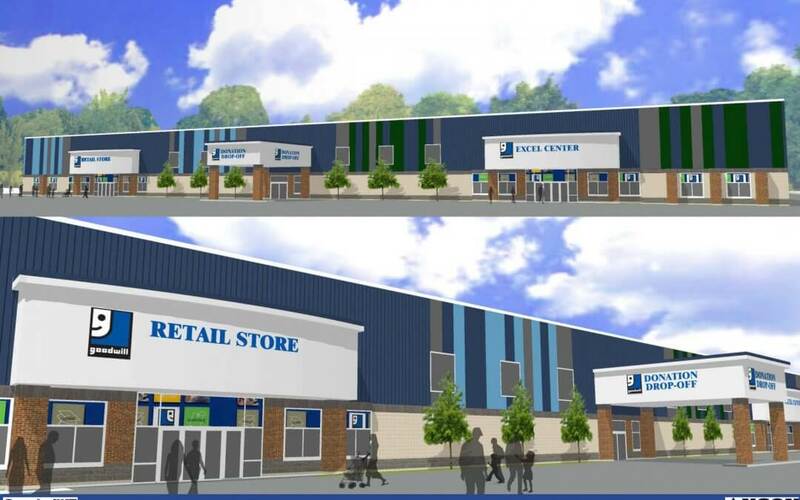 The outlet store will replace Goodwill’s existing Gary clearance store at 1845 W. Ridge Road, Coble said. She said the charter school will have a capacity for 250 students. She said negotiations are still ongoing with Ivy Tech, 1440 E. 35th Ave., to use its shuttered Gary campus for the charter school until construction is completed, likely in April, 2019. Goodwill operates 11 Excel Centers in Indiana. It opened a charter school in Hammond last year. The Indiana State Charter School Board sponsored the charter. Graduates will be required to gain a certification in an in-demand employment field to improve their chances of getting a job, Coble said. Funding for dropout recovery schools is routed from the state’s Workforce Development Department to the Department of Education, Coble said. It does not come from the same funding stream that finances K-12 schools, she said. Gary School Board member Robert Buggs, who’s a Goodwill advisory board member, said the school will help veterans, ex-offenders, and others who need a high school diploma. In partnership with Gary, Goodwill is also involved in the Gary for Life initiative aimed at reducing violence and the Nurse-Family Partnership that pairs registered nurses with more than 180 low-income new mothers.